As internal door handles and door hardware in general is in almost continuous use throughout the day, it is hardly surprising that in time you may need to tweak the fittings to sustain a smooth opening and closing of the door. Keep reading for our four favourite tips on what to do if your door handles need a little TLC! Do you have a wobbly knob or door handle? As simple as it may sound, just by checking that all the fittings are in place and tightened up regularly can increase the life span of your door handles. Internal door handles are usually supplied with bolt-through fixings and surface screws so ensure to use them all when fitting your door handles. Don’t forget the grub screws, keeping these tightened up against the spindle will reduce the chance of the spindle slipping or not turning with the handle to retract the latch bolt. If your door handles have been fitted for many years you may find they have become quite stiff or even let out a squeak now and again. In this instance, we would recommend lubricating the coil spring on the underside of the rose or backplate using graphite powder or another appropriate lubricant. Avoid spray on lubricants as these can be sticky which causes dirt to build up or even create run stains on your internal doors. If you’ve got small children, then you’ve probably witnessed them swinging on the doors at some point in time. This or just the frequent opening and closing of heavy doors can cause the hinge screws to loosen. Tightening the fixings screw each few months can stop them from working their way out and the door dropping overtime. If it’s too late and the screw holes are now too large for the screws to bite, then remove the door hinges and fill the holes before refitting the door. Is your door latch out of alignment with the strike plate? Whether vertically or horizontally out of align this is usually caused by a drop in the door or warped door frame. If it is only a millimetre or two out of align then you may get away with filing the strike plate keep hole to accommodate the latch bolt. Otherwise to fix properly you will first need to check that the door hinges haven’t come loose, tightening if necessary (as above) and make sure your frame is square. Once checked, measure the amount in which the strike plate is out of align, remove the plate and refit it in alignment with the latch bolt. 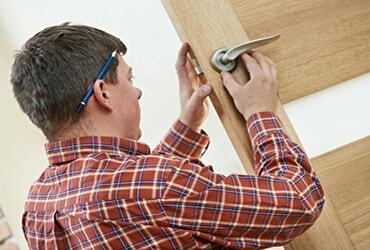 Please read Updating your New Home or Painting Internal Doors for more great tips.